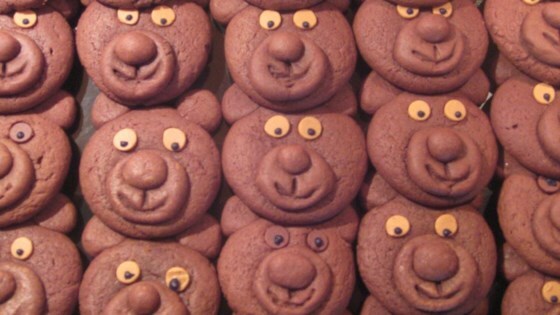 "Cookies shaped like teddy bears." Cream together the butter or margarine, sugar and vanilla. Add the eggs. In a separate bowl, mix dry ingredients. Gradually add to the creamed mixture and blend. Chill until firm. For each cookie: Roll: 1 ball for the body (1 inch), 1 ball for the head (3/4 inch), 4 small balls for arms/legs (1/2inch), 2 smaller balls for ears, and 1 tiny ball for the nose. Arrange on ungreased cookie sheet. With tooth pick, draw eyes and mouth. Bake 6 minutes or until set. Let cool 1 minute, then remove from cookie sheet. Optional: Make a ribbon around their necks using licorice whips (after baking). I have loved this recipe since I was little (in the 80s)...one important thing allrecipes leaves out is CHILL DOUGH FOR AT LEAST TWO HOURS before trying to make the bears. Overnight is best. This a a great cookie, but take a good vanilla butter cookie and along with the teddy bear cookie formula, make panda bear cookie for a spin on this cookie! Fun recipe and very tasty cookies. More like a brownie than a cookie and very fudgy. Big hit. Super cute and tasty! Made for a bake sale. Everyone loved them.